Over the next few weeks I’m going to explore the wild and wooly world of hotel contracts, with the goal of giving you the additional insight and confidence to successfully navigate through your negotiations. This isn’t a “How to Negotiate” series – there are 1.3 million books written for that purpose. Instead, we’ll be taking the most contentious hotel contract clauses and diving right into middle of your sales manager’s brain to better understand what they’re thinking when they’re working through the negotiations with you. By understanding their perspective, you’ll find your confidence growing, which will lead to solid negotiations that form the foundation for a successful hotel relationship and meeting. During my hotel sales days, of all the contract clauses I would negotiate with my customers, none created more tension than that hairy attrition clause. I could even go further and say that of all the industry events I’ve attended (MPI, PCMA, etc.) this little attrition clause has garnered more time in breakout sessions than any single topic ever. Yes, this baby has been beaten, battered, and stomped on. But before I jump into the briar patch, let’s start out with a short definition. 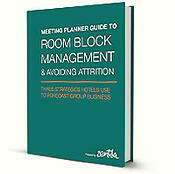 Attrition is the difference between your contracted rooms (your room block) and what actually checks in (your pick-up). So what gives? Why has so much time been centered on attrition? It comes down to 3 simple words: Out-Of-Control. And no outcome is more out of our control – both for planners and hotels – than trying to predict attrition. Here are just a couple examples. Your company sells a division: Bummer. Eastern region doesn't show up. Subtract 65 rooms. Flu hits Chicago: Throw-up central. Midwest sales team is down for the count. Subtract 25 rooms. So what can you do to mitigate your risk while providing the hotel with the revenue assurances that they need in order to seal the deal? Space and time: The hotel will work to resell your space, but you’re going to have better luck when you give them enough time to do it and enough meeting space to do it with. No pain, no gain: When you’re in a pickle, a solution will be far more likely if you realize there will be pain on both sides. It’s not in the hotel’s DNA to make pain: Hotels are a service business. They’re built to make you happy. The last thing your hotel ever wants to do is charge you for penalties. If that’s not possible, then they’ll likely walk on hot coals for you in order to get to the result that causes you the least amount of angst. But they do have a financial responsibility to their owners and brands to be profitable. So the first take-away is that there are no right answers when it comes to solving tricky attrition issues. Over-communicate with the hotel: As soon as possible, tell the hotel. I was always surprised at how often this didn’t happen. The sooner the hotel knows, the sooner they can mobilize to help you fill your rooms. Be open to all suggestions they might have. Give back meeting space: This one is the toughest for planners but is critical to any hotel’s ability to help you. Use the hotel’s experts in their function space to help you map out the revised space for your program. Allow the hotel to offer lower “fenced” rates than your group rate: This is fancy-schmancy lingo for creating reservation rules that ensures your attendees won’t have access to future lower rates, while allowing hotels to maximize their occupancy. This is tricky, but worthy of a discussion. This one is a bit more complicated as you’re already on property and your program is about to begin. At this point, you’re really trying to figure out how to limit the exposure for both the hotel and your organization. Trade attrition penalty for increased Food & Beverage spend: Ask the hotel if you can offset any attrition damages with increased food and beverage spend on property. You’ll likely not get an equal amount of attrition credit to F&B spend, but it is additional revenue to the hotel and they will want that. Try to make the new meeting happen in the same year you had the attrition (called “in-the-year, for-the-year”). Is there a larger meeting than the one in attrition you can bring? Can you sign the contract while still on-site? The biggest risk to hotels when they charge you hangs on the relationship and their future with you. They really don’t want to mess that up. Successful negotiations mean understanding what’s important to the other side. When you understand that the hotels want to help you, it makes the conversation – and the compromise – that much more meaningful and ultimately results in a solution that may still have a little pain on both sides, but one that protects the most important part: your partnership. No one knows the woes of attrition clauses better than planners and hotel salespeople. So have at it! Tell us (and your fellow planners and salespeople) the creative ways you’ve dealt with this issue in the comments below. Download this valuable resource - keep it handy for your next meeting request.